Hello, Dolly! is one of Broadway's most enduring and delightful musical comedies. Based on the uproarious comedy The Matchmaker by Thornton Wilder, Hello Dolly! tells the story of widowed matchmaker Dolly Levi, who connects, meddles, and negotiates everyone's perfect match. Through a series of comedic romantic entanglements, even she finds her perfect man. 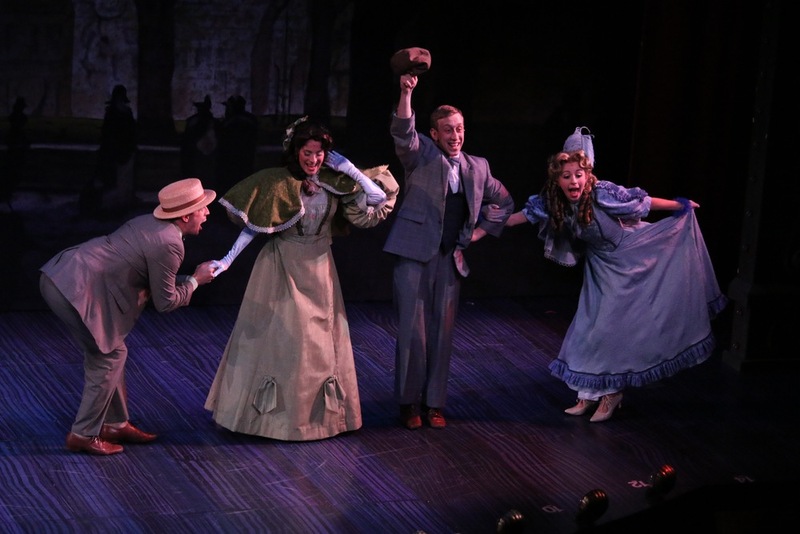 Riverside Theatre exploded with color, dance and song during Tuesday evening's opening of "Hello, Dolly!" Maddy Apple* (Ensemble) is thrilled to be making her debut at the Riverside in Hello, Dolly! She is originally from Jupiter, FL and is honored to be working in her home state. Favorite Credits: Irving Berlin’s White Christmas (National Tour 13’/14’); Saturday Night Fever, Nunsense (Finger Lakes MTF); A Wonderful Life, Hello, Dolly! (Goodspeed). BFA Drama NYU-Tisch. A big thank you to the cast, crew, and creative team! All the love to Mom, Dad, Harrison, Ben, Holly, John, Bubbe, and all of my FL fans. www.maddyapple.com insta: @maddyapplechoreography Protect your heART! James Beaman* (Rudolph Reisenweber) appeared last season at Riverside as Bela Zangler in Crazy For You. Recent credits: the acclaimed A Wilder Christmas Off-Broadway; Nice Work If You Can Get It, opposite Sally Struthers, at Ogunquit Playhouse; Peter and the Starcatcher at Pioneer Theatre Co.; Thénardier in Les Misérables at Orlando Shakespeare Theatre (Broadway World Award); and John Adams in 1776 at Cape Playhouse, directed by James Brennan. James starred as Sir Robin in the First National Tour of Monty Python’s Spamalot and has created roles in two new musicals, Frog Kiss and The Road To Qatar! (Off-Broadway/Cast Album). Visit James at www.jamesbeaman.com. Ryan Breslin* (Barnaby Tucker) is thrilled to be making his Riverside Theater Debut! Broadway: The Book of Mormon, Newsies OBC(Race) Regional: The Muny: Cats (Mungojerrie) Showboat. Bucks County Playhouse: The 25th annual Putnam County Spelling Bee (Coneybear) TV: “Person of Interest.” Film: Hail Caesar! A Coen Brothers film. Love to HCA, Mom and Dad and Grandma! Chloé Davis* (Ensemble) is excited to make her Riverside Theatre debut in Hello Dolly! She is a St. Louis native and went on to receive her BA from Hampton University and MTHM from Temple University. Credits: Cabin In The Sky (Encores); Philadanco! ; The Addams Family (Tour); Sid The Science Kid Live (Tour). Chloé started DANCE FOR ALL: Creative Expressions For The Disabled to give people with a range of disabilities the opportunity to experience the joy of artistic expression. Thanks to all family and friends who have supported and shown great kindness! Michael Peter Deeb* (Ensemble) is thrilled to put on his Sunday clothes and make his Riverside debut! National Tours: A Chorus Line (Mike), Young Frankenstein (Swing). Regional favorites: West Side Story (Snowboy, Ogunquit Playhouse), Young Frankenstein (Dance Captain/Assistant Choreographer, MTWest; Ensemble, Gateway/Ogunquit Playhouse), A Chorus Line (Mike/Bobby - NBFT/Crest Theatre), and The Wizard of Oz (Northern Stage). Michael holds a BFA in Dance from the University at Buffalo and is a proud member of AEA. A Buffalo native, he is excited to spend winter at the beach! Thanks to the Riverside team, Wojcik/Seay Casting and MSA! Love to family, Eric, and Koko! For Gramma. Kelsey Flannery (Ensemble) is thrilled to be joining Riverside Theatre this year as a performance apprentice! She has recently graduated from Morehead State University in Kentucky with a theatre degree, as well as taken classes through Cincinnati Conservatory of Music. She has performed on stages in Kentucky, Virginia, Ireland, and China. Some of her favorite shows she’s performed in have included Cabaret, Fiddler on the Roof, Evil Dead: The Musical, and The Children’s Hour. Chloe Fox (Ensemble) is a graduate of NYU Tisch’s CAP21, and most recently appeared as Morticia in The Addams Family (Palace Theatre). Favorite credits include The Tempest, with Sam Waterston and Jesse Tyler Ferguson (The Public/Shakespeare in the Park), Grease (Theatre by the Sea), Cats (Flat Rock Playhouse), and the regional premiere of Saturday Night Fever (Merry-Go-Round Playhouse/Finger Lakes MTF). Danielle Marie Gregoire* (Ensemble) is delighted to be making her Riverside debut! Most recent: ASF’s Disney’s The Little Mermaid (Arista/Ariel Double). Performed with the cast of Broadway’s Mamma Mia! at Madison Square Garden and in Las Vegas. Some favorites include: Sandy in Grease, Audrey in Little Shop and Cora in Thoroughly Modern Millie. OCU MT. Special thanks to Wojick Seay Casting, everyone at Riverside, B for being my rock, and my parents for following and supporting me wherever my dreams take me! Je suis beni. Samantha Grossman (Ensemble) was most recently seen as Connie Wong in A Chorus Line and as Pansy in the original musical, Poodleful. Other past credits include: Our Time: A Graduation Mixtape (54 Below), The Pajama Game (Ann), Great Wall (Michelle), Little Miss Fix It (Neptune), West Side Story (Maria), and Hatched: New Works in New York (Joe’s Pub). Love and thanks to Mom, Dad, and Ethan for all their unwavering support! Katherine Hintz (Ensemble) is a recent college graduate from Atlanta, GA with a degree in Theatre from Samford University. She has also trained at The Second City Chicago. She has performed on stages in Atlanta, Birmingham, and Chicago. Some of her favorite roles include Nora in Assistance, Veronica in God of Carnage, Nina in Vanya & Sonia & Masha & Spike, and Aaronow in Glengarry Glen Ross. She is very excited to be working at Riverside this year as a performance apprentice! John Jeffords* (Ambrose Kemper) is over the moon to be back at the Riverside! He was previously seen here as the Lead Tenor in The Producers, a role he has also performed at Kansas City Starlight, Atlanta Theatre of the Stars, Olney Theatre, and The Forestburgh Playhouse. New York Credits include: Babes in Toyland (Lincoln Center), and Bombshell Baby! (Ensemble Studio Theatre). Regional: The Who's Tommy (Tommy understudy), Cinderella (Prince understudy), Life Could be a Dream (Skip). BFA Musical Theatre - University of Arizona. Much Love! Katie Keller (Ensemble) is originally from Fort Lauderdale. She graduated in May from Texas Christian University in Fort Worth, TX, where she earned her BFA in Theatre with an Emphasis in Acting. Her favorite previous roles include Cosette in Les Misérables, Rosemary in How to Succeed in Business Without Really Trying, Muriel in Ah! Wilderness, and Sarah in Born on a Sunday. She is super excited to be performing in Riverside Theatre’s first original musical Poodleful! Alyssa Malgeri* (Minnie Fay) is thrilled to be back at Riverside Theatre, where she previously played Olive in Spelling Bee. National Tour: Hairspray (Penny Pingleton). Regional: Marvelous Wonderettes (Missy), Spelling Bee (Logainne), High School Musical (Sharpay), Sisters of Swing (Patty Andrews), Baby (Lizzie), Beauty and the Beast (Belle) and more! BFA from NYU. Thanks to family and friends for their love and support! For Andrew & Coop. Elliot Mattox* (Ensemble) is so excited to make his Riverside Theatre debut in Hello, Dolly! Regional: Gangster in The Drowsy Chaperone (Cape Playhouse); Patsy in Spamalot, Hugo in Bye Bye Birdie, Rocky Horror Show (Lyric OK); Robertson Ay in Mary Poppins and eight others (MTWichita); Hello, Dolly! (MUNY). Proud Oklahoma City University grad and AEA member. Special thanks to Gayle, James, Dustin, The MINE, and Michael. I love my family! I love my friends! I can’t thank them enough. Life is good. Cheers! Bethany Anjelica Menjivar (Ensemble) is a Pittsburgh, PA native currently residing in NYC. Most recently, Bethany was lead wicker dancer, Trinity, and tribal drummer in 1031 Production’s New York Haunted Hayride. As Trinity, she appeared on “The Today Show” with Kathie Lee and Hoda. She is currently a member of Denise Caston’s NYC tap company. Musical theater credits include Millie Dillmount (Thoroughly Modern Millie), Rizzo (Grease) and Diva (Starmites). Bethany won a spot at the National High School Musical Theater Auditions as a result of winning the 2011 Henry Mancini Awards (Pennsylvania) for best actress in a musical for her role as Millie Dillmount in Thoroughly Modern Millie. Linda Neel (Ensemble) is happy to return to land in this production of Hello, Dolly! For the past two years she's been performing on Norwegian Cruise Line traveling the Caribbean and Baltics. Linda is a LA native and has been a part of numerous musical productions near and far. Linda would not only like to thank the patrons and theatergoers of the Riverside Theatre for their support of this art form, but also thank her parents who will most likely drive out from California to see her. Sean Potter (Ensemble) is beyond thrilled to be working as a performance apprentice for Riverside Theatre’s 2015-2016 season. Originally from New Haven, CT, he is freshly graduated from Pace University’s Musical Theatre program where he was seen in Kiss Me, Kate, Anyone Can Whistle, and Ryan Scott Oliver’s We Foxes among others. He also had the opportunity to work behind the scenes on main stage musicals, such as working alongside Victoria Clark as her Assistant Director on The Light in the Piazza in the fall of 2014. In winter of 2014, Sean made his NYC stage debut in Fabulous! The Musical as Boy 2 at the Time Square Arts Center. Kristen Brooks Sandler (Ermengarde) is so excited to be making her Riverside Debut! BFA Elon University. Credits: Joseph and the Amazing Technicolor Dreamcoat National Tour (Ensemble, Directed & Choreographed Andy Blankenbuehler), Elf! National Tour (Swing, Asst. Dance Captain), Someone to Belong To (Maggie), How To Succeed… (Rosemary), Man of La Mancha (Fermina). Much love to family, friends, the amazing Eddie Rabon, and L.
www.KristenBrooksSandler.com // IG:@kristenbrooks19… Toi toi toi and enjoy the show! Jeff Sears* (Cornelius Hackl) is very excited to join Riverside for the first time with such a great cast and creative team. Off-Broadway: Avenue Q (Princeton/Rod). First National Tour: The Book of Mormon (Elder Davis) Regional: Goodspeed’s City of Angels (Jimmy Powers) and Alabama Shakespeare Festival’s The Little Mermaid (Prince Eric). Carnegie Mellon University. BFA University of Kansas. Love to the fam, Allie and Bails. Jennifer Seifter (Ensemble) could not be more excited to be back on the stage and spending the winter months in Florida with her new family at Riverside Theatre! She is a graduate of NYU Tisch School of the Arts, and has appeared in numerous regional productions, as well as spent 3+ years at sea as the Swing/Dance Captain aboard Disney Cruise Line. Most recently, Jennifer was seen dancing and double dutching across the country with the Memphis National Tour. A huge thanks to Mama Trish and her unending support! Roger Preston Smith* (Judge) Broadway credits include: both the Cathy Rigby and Sandy Duncan productions of Peter Pan; Hello, Dolly with Carol Channing; Wizard of Oz starring Roseanne; Me & My Girl starring James Brennan; and Patti LuPone’s Gypsy (Assistant Choreographer). National Tours include: Oklahoma, Evita, and Annie Get Your Gun. On TV he has performed on “The Knick,” “Saturday Night Live,” “Today Show,” “Macy’s Thanksgivingday Parade”, “Cathy Rigby is Peter Pan,” and Bette Midler’s “Gypsy” (Assistant Choreographer). Regional theatre includes: Paper Mill Playhouse, Houston Grand Opera, Sacramento Music Circus, Alabama Shakespeare, Westchester Broadway, Houston TUTS, North Shore Music, Ogunquit Playhouse, Mill Mountain and Arkansas Rep. Proud member for Actors’ Equity. Adam Soniak* (Ensemble) is ecstatic to be performing in one of his all-time favorite musicals. International Tour/West End: West Side Story (Riff u/s). Regional: The Sound of Music (Paper Mill Playhouse,) West Side Story (Westchester Broadway,) Saturday Night Fever (Finger Lakes Musical Theatre Festival,) Cats (Gateway Playhouse.) Big hugs and kisses to the cast and crew. Special love and thanks to his incredibly supportive family! 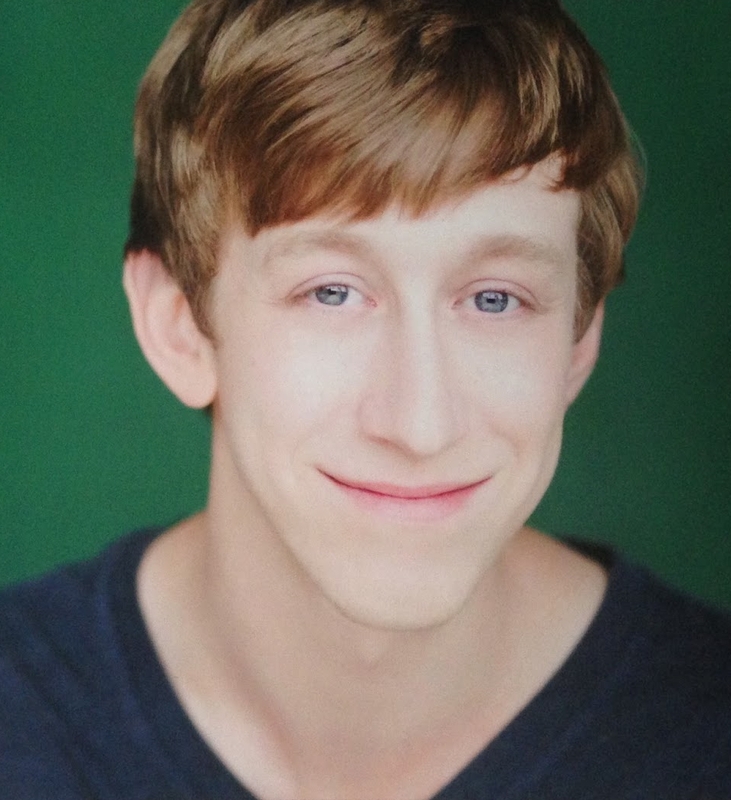 Lucas Thompson* (Ensemble) is thrilled to "put on his Sunday clothes" at Riverside! Major credits include Cats (North American Tour), La Cage aux Folles (North Shore Music Theatre), Good News! 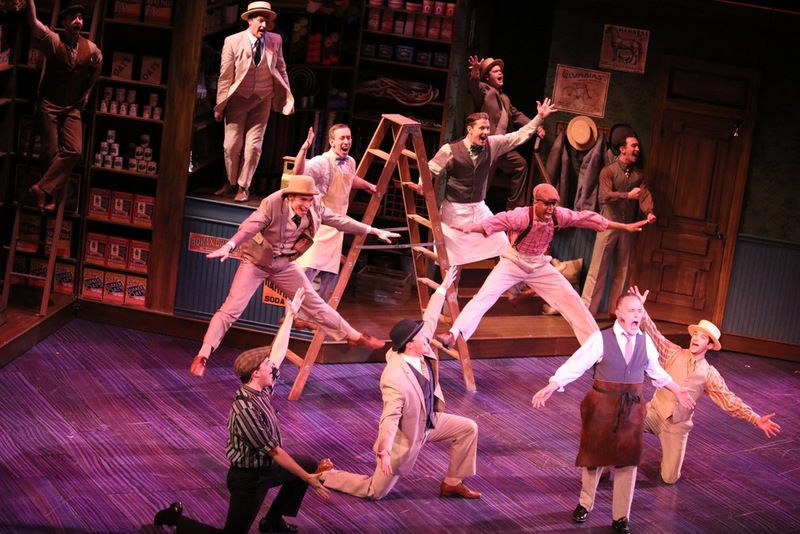 (Goodspeed), Fiddler on the Roof (Westchester Broadway), The Music Man (Theatre Under the Stars) and West Side Story (IU Opera Theater) directed by Broadway's Josh Bergasse and Rob Fisher. Hailing from Indiana, Thompson is an alum of the Jacobs School of Music where he completed both his bachelor's and master's degrees in opera. Many thanks to Wojick/Seay, Daniel Hoff Agency, and my family/friends! This one's for you, Dad. Ian Thomson (Ensemble) is thrilled for his Riverside Theatre mainstage debut. Recent credits include: Poodleful (Nigel/Detective Delby), Fiddler on the Roof (Tevye), The Prophet (Metwali), The Burial at Thebes (Haemon), Guys and Dolls (Sky Masterson), and A Month in the Country (Beliaev). Training: BA in Theatre, Davidson College; The British American Drama Academy. He would like to thank his family, friends, and teachers for their support, and of course Riverside Theatre for this wonderful opportunity! Christopher Tipps (Ensemble) is excited for his debut at Riverside Theatre in Hello Dolly! He is a Texas native who was in the regional debut of 13! The Musical at Theatre Under The Stars, as well as Les Miserables, White Christmas, and Geppetto and Son. He gives plenty thanks to the support of his loving family and friends, and gives a shout out to his management team, Tammie, Gerald, Maethenia, and Lisa!